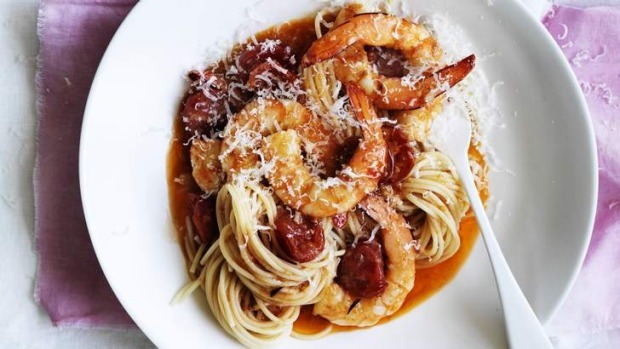 The addition of prawn oil and a touch of butter adds a bit of luxury to this simple pasta dish. And don't worry about the old rule of "no cheese with seafood pasta" - do what you like! Peel the prawns, reserving the heads and shells. Remove and discard the intestinal tract. Set the peeled prawns aside in the fridge. For the prawn oil, heat 1 tbsp of the olive oil in a small saucepan over medium heat and add the onion, salt and the prawn heads and shells. Stir until the heads and shells are bright orange and fragrant. Add the remaining oil and cook over very low heat, uncovered, for a further 20 minutes, stirring occasionally. Pour the oil through a fine sieve to remove any solids. You should be left with just over a quarter of a cup of prawn oil. Cook the spaghetti in plenty of boiling salted water according to the packet directions. About 6 minutes before the pasta is ready, heat half the prawn oil in a large frying pan over medium-high heat and add the garlic and onion. Keep the other half of the prawn oil for another purpose. Fry for a minute or two until fragrant, then add the raw prawns, cherry tomatoes and salt. When the prawns are nearly cooked, add the white wine and butter and bring to a simmer, stirring frequently. When the pasta is al dente, transfer it straight from the water to the frying pan and toss with the other ingredients. Add about two tablespoons of the pasta water to the pan and toss to emulsify into a light sauce. Toss through the parsley and serve immediately with a very light scattering of freshly grated parmesan cheese. The key with oil-based pasta sauces is that they shouldn't taste oily. Transferring the pasta straight from the pasta water into the pan brings a little of the pasta water with it to help emulsify the sauce. Correction: the original version of this recipe published in Sunday Life listed the serves as six. This recipe serves two.